good or evil in the 21st century? Link: The Joy of tech | Tech News on ZDNet. I want to believe, I really do. I agree with all the talking points — big corporations will resist new media every time because it’s better for their bottom line; overly strict interpretation of copyright will hurt creativity and business; 95 years is way too long for copyright protection terms; businesses need to stop fighting electronic distribution and embrace it; corporations don’t need the encouragement of a supreme court win; yada yada. What I just don’t get is how to make the leap from that to the conclusion that a tool expressly made for illegally sharing copyrighted materials must therefore be legal. Oh, come on! (in Rob Corddry voice) First, are we talking about Grokster (and Morpheus) or the entire Internet? Programmers use Grokster to swap code? What the hell for? And when did papers get so big that email or ftp or http didn’t suffice? Who goes out of their way to use a special tool for this stuff? (Besides, of course, the enthusiasts who this week are posting Grokster briefs and materials in seemingly every p2p/torrent format they can find, as if to say look! legitimate uses! see, we told you!) Little-known musicians, okay sure, the more distribution the better, but really, if the demand for my music is so high that I can’t handle the bandwidth from my web site and need to go to p2p or bitTorrent, then I’d probably celebrate, then go invest in a bigger server. Look, I’m sure there are exceptions in all these cases, but my point is that all of these things were possible before Grokster. Even the pro-Grokster forces readily admit that the makers of Grokster were in it to make money off of people illegally sharing copyrighted materials. But, but… isn’t Grokster just the wedge in the door? If we lose this one, then there’ll be no stopping the big corporate bullies. This seems to be the main line of argument for why the Supreme Court should find in favor of Grokster and Streamcast. I confess that I don’t know enough about the courts or how powerful a precedent this would be, but as a lay person I have a hard time buying it. Granted the public and media will surely perceive a loss in this case as a huge blow, even if it doesn’t in actual/legal truth mean the sky is falling on the internet. That would surely be unfortunate, but both sides will have contributed to that scenario. I just don’t get how a ruling against Grokster necessarily leads to every other kind of sharing/copying technology getting killed. "The Connection" call-in show on NPR today was about this topic (4), and a few of the callers made this point better than I can: people would say to Lessig, in effect, "I get everything you’re saying, but everyone knows Grokster is for making illegal copies so it should be illegal, right?" The responses were always something like "we don’t condone illegal uses, but this is about so much more than Grokster!" Well, maybe it is… I don’t know. envision "a guy sitting in his garage inventing the iPod." powerful interests had engaged the court. Isn’t that statement about Souter a little odd? Do you see that kind of comment about judges hearing cases on other specialized topics, that aren’t technological? There’s an implicit argument in a lot of writing about law and technology, that this high-tech stuff is too complicated for lawyers and politicians to grasp and so they’ll never legislate it properly. But this is just arrogance. There should be little doubt that experienced judges can hone in on the truly important issues at stake, even if they do still write on paper. The last people I’d trust to get to the bottom of the essential human and societal aspects of computers are computer scientists (and I say that as a computer scientist). For far more incisive/coherent writing about techno-biases like this, see Paulina Borsook’s book (6). obsession with technological advances, what can be done? of technologies we are providing and realistic about what it provides. Another new, and perhaps more controversial, book with a similar theme is The Last Well Person: How to Stay Well Despite the Health-care System. The book and its author, Nortin Hadler, are profiled in this recent article. Link: Alternet: Miracle Malpractice, via Bookslut blog. Ordinate’s Bernstein claims the SET is fairer than other similar exams. subject to the caprices and prejudices of human judgment. kinds of tests," she said. "With [the SET], there is none." You can try a demo version online (and over the phone) at Ordinate’s website. The image above is from the test instructions. 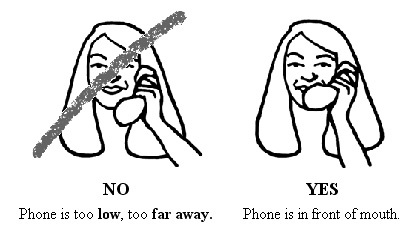 Apparently you’re screwed if you aren’t loud enough (or have a bad connection or use a wireless phone). Link: eSchool News Online: High-tech test for spoken English. will this growth lead? Can it be consolidated or sustained? with luck and wisdom, shape its outcome.